Come by the store on Tuesday, August 11, at 7 PM up on BookPeople’s second floor, for a great home-grown event. Presented by Austin Mystery Writers, and edited by Ramona DeFelice Long, Murder on Wheels: 11 Tales of Crime on the Move has deliciously dangerous tales contributed by many of our favorite authors. Kathy Waller, Reavis Wortham, and MysteryPeople’s own crime fiction coordinator, Scott Montgomery, will all be present at BookPeople’s Murder on Wheels event to speak and sign this collection. A share of profits goes to Meals on Wheels. 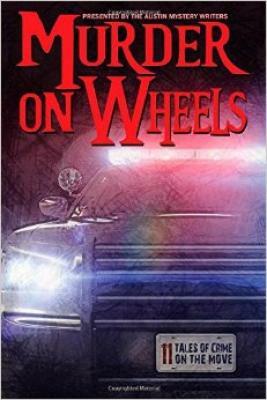 Murder on Wheels contains many different settings, subgenres and approaches to its theme. Kaye George, in her forward, details the collection’s origin: “The genesis was a ride my husband took…on the Megabus…I started thinking that the bus would make a good setting for a murder…There was one problem – where to hide the body. So I asked the group, Austin Mystery Writers, for suggestions.” From this initial discussion, sprang enough ideas for a collection, and thus Murder on Wheels came to be on our shelves. “A Nice Set of Wheels,” by Kathy Waller, delivers a Great Depression-era story of longing and wanderlust in a small Southern town. “Family Business,” by Reavis Wortham, relates the twists and turns of an unlucky family of bootleggers through the generations. V. P. Chandler’s “Rota Fortunae” gets mystical with a tattoo of a ship’s wheel and a story of transatlantic unrest, while Gale Albright’s “Mome Rath, My Sweet” sends a private eye down the rabbit hole in a hard-boiled retelling of Alice in Wonderland. Kaye George and Earl Staggs shift the focus to public transportation with their respective stories, “The Wheels on the Bus Go Round and Round” and “Dead Man on a School Bus.” Laura Oles looks at how a “family business” deals with outsiders in “Buon Viaggio.” Gale Albright’s “Apokalypse Now” tackles the dangers of bicycle obsession, especially in a marriage. Scott Montgomery’s tale of generosity gone sour, “Red’s White F-150 Blues,” is a properly Texan tale of trucks, Conan the Barbarian obsession, and increasingly bad decisions. Each story fits with the theme of wheels in a different, unique, and often funny way. You can find copies of Murder on Wheels on our shelves and via bookpeople.com. Come by the store Tuesday, August 11, for a speaking and signing event with several of the collection’s authors, including our very own Scott Montgomery!